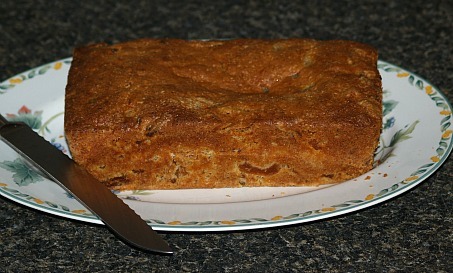 When I learned how to make quick bread recipes I learned that they go way back before the colonies. The overall classification refers to loaves (sometimes called tea bread recipes), muffins and pancakes which are considered “quick” because they customarily rely on baking powder or baking soda for fast leavening, unlike yeast. When I learned how to make quick bread recipes I also learned that they basically contain the same ingredients; flour, leavening, eggs, fat and liquid. With the addition of fruits, nuts and various flavorings is how the wonderful flavors come about. If you are learning how to make quick bread recipes, the batters might be soft dough like biscuits, drop batters like drop biscuits or dumplings or a thinner batter like cake batter. Many of my recipes are made and mixed like muffin recipes; only mixing until dry ingredients are moistened. Each recipe will specify so follow the instructions. 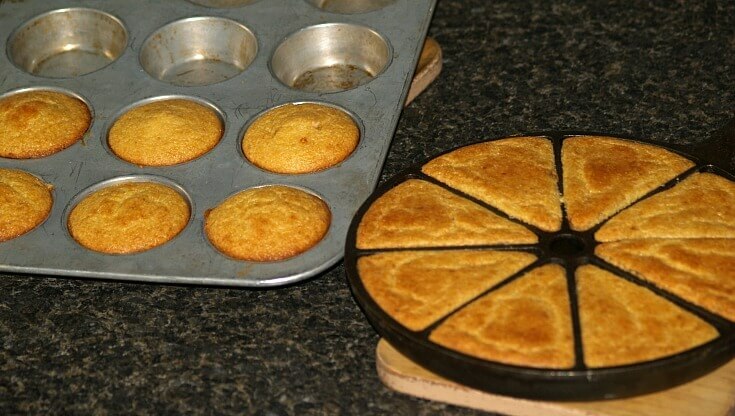 Learn how to make quick bread recipes with corn meal; really good. Combine all dry ingredients in mixing bowl; add eggs, butter, sour cream and milk. Beat until well blended; pour into greased 9X13 inch baking pan. (I used a cornbread mold and had enough batter for 6 regular size (cupcake) muffins. Lightly grease 2 8 ½ x 4 ½ inch loaf pans. Combine the two flours, baking powder, salt and pecans; stir to blend in a medium size bowl. In another bowl combine the milk, eggs, honey, melted butter and vanilla; blend well. Stir liquid ingredients into the dry ingredients and stir to blend well. Divide the batter evenly between the two prepared pans. Bake for 45 to 50 minutes or until a pick comes out clean. Let cool 15 to 20 minutes before removing from pans. Cover the apricots with water and simmer for a few minutes until the apricots plump up: drain. Combine the butter and sugar in a large mixing bowl and cream together. Add eggs, yogurt, orange juice and almond; beat to mix in. Stir in the drained apricots, bran and orange rind. Sift together the flour, salt, baking powder and soda; Blend into the creamed mixture. Pour batter into prepared loaf pan and bake for 1 hour or until pick comes out clean. Combine sugar, oil, evaporated milk, eggs and milk in mixing bowl; beat with mixer until blended. Sift flour, baking powder and salt together; add to the egg mixture and beat on low until blended. Add poppy seeds and vanilla; mix until blended. Pour into 2 lightly greased and floured loaf pans. Bake in preheated oven at 350F degrees about 50 minutes and golden brown. In this bread recipe both baking powder and baking soda are used as the leavening agents. Preheat oven to 325F degrees; grease and flour 2 loaf pans. 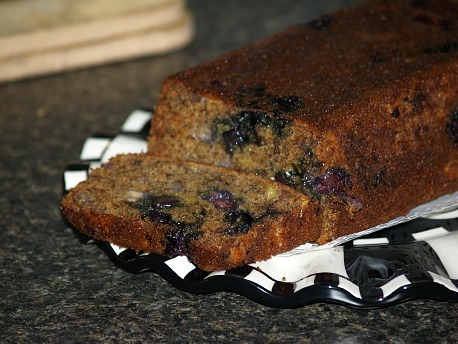 Toss blueberries with 2 tablespoons flour; set aside. Combine butter, sugar, eggs, vanilla and bananas in large mixing bowl. Mix until well blended scraping bowl occasionally. Add remaining flour, allspice, soda, baking powder and salt; beat on low speed until well blended. Fold in blueberries; pour batter evenly into prepared pans. Bake 45 to 50 minutes or until pick comes out clean. Cool on rack 10 minutes; remove from pans and cool completely. Preheat oven to 350F degrees; well grease and flour 2 loaf pans. Combine and beat bananas, sugar, eggs and butter. Combine flour, baking powder, soda, cinnamon, nutmeg and salt together. Add dry ingredients alternately to the egg mixture with the milk; mix until well blended. Stir in 2 cups of pecans and the butterscotch chips; divide batter evenly between two prepared pans. Sprinkle tops of loaves with remaining pecans; bake 60 to 70 minutes. Cool bread 15 minutes and remove from pans. Preheat oven to 325F degrees; grease 2 loaf pans. Combine eggs, sugar oil and 2 teaspoons flavoring; beat to blend well. In another bowl combine flour, soda and baking powder. Add flour mixture to egg mixture alternately with buttermilk. Stir in coconut and nuts; divide evenly between 2 prepared pans. Bake 50 to 60 minutes or until pick comes out clean; cool 10 minutes and remove from pans. For glaze combine sugar, water and butter in saucepan; boil 5 minutes and add flavoring. Drizzle glaze over bread loaves. Sift together flour, salt, sugar and baking powder; add eggs and milk beating until smooth. Fold in orange peel; spread batter evenly in 2 prepared pans. Let pans stand for 30 minutes; PREHEAT OVEN TO 375F degrees. Bake for 45 to 60 minutes until pick comes out clean. Cool 10 minutes; remove from pans and cool. NOTE: This bread makes good sandwiches by spreading with softened cream cheese.